Международная федерация шашек IDF – Секция-64 FMJD в соответствии с календарем соревнований на 2015 год проводит с 25 августа (день приезда) по 4 сентября (день отъезда) 2015 года в спорткомплексе «Аквалайф», п. Кранево, Болгария, Чемпионат мира по шашкам-64 среди ветеранов. 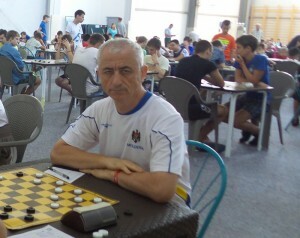 Завершился Чемпионат по классической игре. 1 место занял международный гроссмейстер Иван Доска из Молдовы. Смотрите результаты. Чемпионат по классической игре завершен. 1 место занял международный гроссмейстер Иван Доска из Молдовы. Зинаида Александрова из Израиля стала лучшей среди женщин. Стартовал Чемпионат по классической игре. Смотрите текущие результаты. Чемпионат стартовал. Церемония открытия прошла в 12.00. 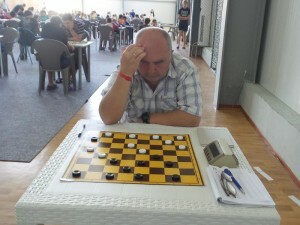 Чемпионат по молниеносной игре начался в 15.00. В соревнованиях приняли участие 20 спортсменов из 10 стран. Чемпионом стал Иван Костионов (Россия). Championship will be held at the Sports Complex «Aqualife», Kranevo (Bulgaria) from August 25, (arrival day) till September 04, 2015 (departure day). Credentials Committee will work August 25, from 14.00 till 22.00. Championship is held separately among men 1965-56 years born, men 1955 years born and older; women 1965 years born and older. Blitz — with time control 3 minutes till the end of the game plus 2 seconds per move. All types of the program will be played with draw according to the official tables of the Section-64 for men and draw of the first move of the white for women. All participants claimed by national federations are allowed to participate in World Seniors Championship-2015. Participants must to be on opening and closing ceremony of the competition. In case of absence the closing ceremony, participants lose all official awards. Awards will not be sent or transferred. Each participant of the competitions should pay organizational tournament fee at the day of arrival: 30 euros for participating in the classic program and 10 euros for the blitz program. Hotel accommodation is in 2-3 bed rooms with facilities in the room. Rooms will be booked in the order of receipt of applications. All participants and accompanying must residence in Sports Complex “Aqua Life” from August 25, till September 04, 2015. In case of violation of this paragraph penalties can be applied. Sports Complex “Aqua Life” is closed and guarded territory. Peoples, who do not live in the complex, will not be allowed to the territory. All costs for participation in competitions are paid by sending organizations. From airport of Varna to the bus station Varna by bus number 409 (the frequency of flights of about 20 minutes). Transfer can be arranged by Sports Complex “Aqua Life”. Applications for participation in the Championship must be submitted to the office of IDF-Section-64 from national Federations not later than July 25 on e-mail: [email protected], [email protected]. Applications for obtaining visas only with letter of guarantee from the national federation about accommodation in the sports complex «Aqua Life» (up to July 19) and booking accommodation (up to July 25) must be submitted to Langina Antonina, tel. +7 921 7777231, e-mail: [email protected]. Application form published on the site. Applications for transfer to the competition and back must be submitted Jordanova Radostina, e-mail: [email protected].